Definitive advantages result from the use of flow nozzles. For a given ratio of throat pipe to diameter, flows nozzles permits approximately 60% greater capacity than an orifice plate. Manufacture all type of low nozzle according to ASME, ISA, UNI, DIN, B.S. etc. standards. • The nozzle is a curved convergent entry leading a short cylindrical throat without a discharge cone. Inlet pressure taps located in the pipe wall at “D” preceding the plane of the nozzle elliptical inlet section, outlet pressure taps located in the pipe wall at “1/2 D” following the plane of the beginning of the elliptical inlet section of the nozzle. 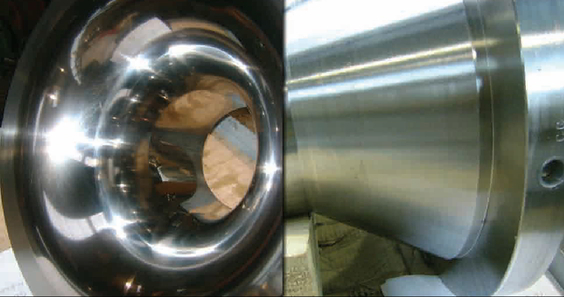 Inlet pressure taps located in the pipe wall at “D” preceding the plane of the nozzle elliptical inlet section, outlet pressure taps located in the pipe or on the nozzle at “1.5 d” following the entrance plane of the nozzle. Can be supplied complete with companion flanges. Upon request flow nozzles can be supplied complete with: seal pots, stop valves, flow straightening vanes, experimental calibration test to an international approved laboratory.